1995 Fadal VMC4020HT 4-Axis CNC Vertical Machining Center s/n 9502947 w/ Fadal CNC88HS Controls,30- Station ATC, CAT-40 Taper Spindle, Thru Spindle Coolant, Servo Coolant Spigot, 4 th Axis Installed, 5CIndexer Interface, Rigid Tapping, Graphics, Hydro Sweep, 20” x 48” Table, Coolant. 2000 Fadal VMC2016L mdl. 904-1 CNC Vertical Machining Center s/n 012000060827 w/ Fadal Multi Processor CNC Controls, 21-Station ATC, CAT-40 Taper Spindle, Rigid Tapping, High Speed CPU, Graphics, 16” x 29 ½” Table, Coolant. 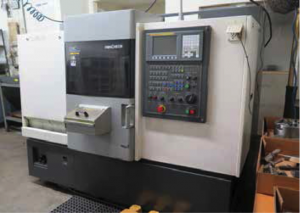 2006 HwaCheon CUTEX 160 CNC Turning Center s/n M024354E3FJ w/ Fanuc Series 0i-TC Controls, 12-Station Turret, Hydraulic Tailstock, Parts Catcher, 6 ½” 3-Jaw Power Chuck, 5C Collet Nose, Coolant. 2004 HwaCheon Hi-TECH200AI CNC Turning Center s/n M013352C1FK w/ Fanuc Series 0i-TB Controls,Tool Presetter, 12-Station Turret, Hydraulic Tailstock, 8” 3-Jaw Power Chuck, 5C Collet Nose, Coolant. Namseon / Acra Turn 1640 16” x 40” Geared Head Gap Bed Lathe s/n N1-8500- 3255 w/ 23-1800 RPM,Inch/mm Threading, Tailstock, 5C Collet Closer, 8” 3-Jaw Chuck, Coolant. Clark Vertical Mill s/n 0608352 w/ Anilam Mini Wizard DRO, 3Hp Motor, 60-4200 Dial Change RPM,Chrome Ways, Power Feed, 9” x 49” Table. Kalamazoo Startrite 24-V- 10 24” Vertical Band Saw s/n 38503 w/ 19” x 19” Table. Rutland 7” Horizontal Band Saw. Drill Doctor mdl. 750X Drill Sharpener. Baldor and Central Machinery Pedestal and Bench Grinders. Central Machinery 4” Belt / 6” Disc Sander. Craftsman Pedestal Drill Press w/ Laser Trac. FS mdl. 445 10Hp Horizontal Air Compressor w/ 3-Stage Pump, 120 GallonTank.